Long-time readers of my blog will know that I'm a big fan of jewellery. 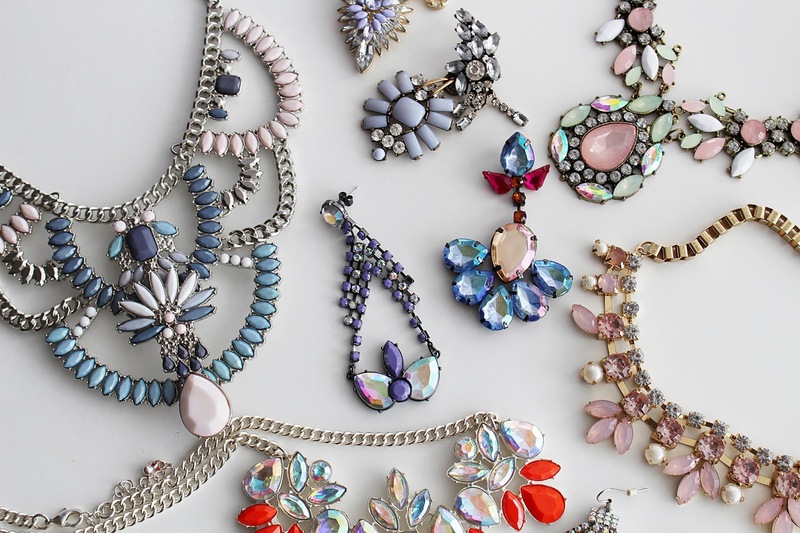 Statement jewellery, in particular, is one of my favourite things to wear to jazz up an outfit. 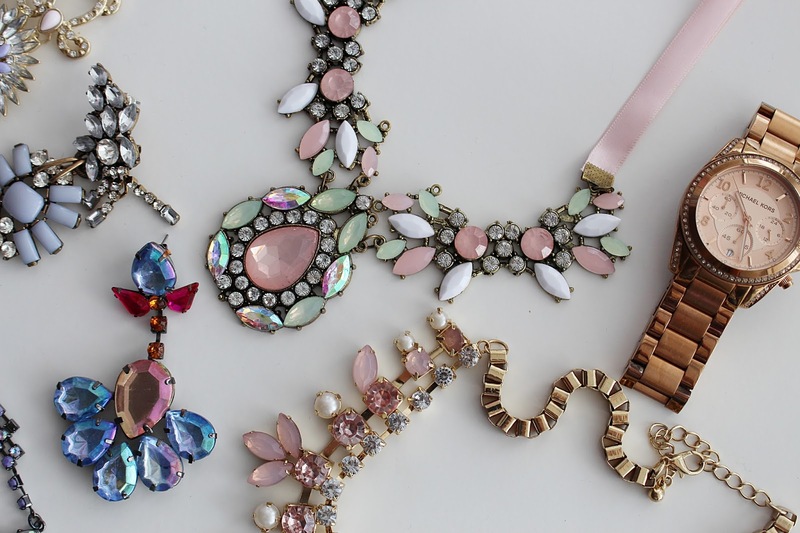 There is nothing better than popping on a sparkly necklace to add a bit of glam to an outfit, or some snazzy earrings to make an up-do all the more classy. Lately statement jewellery is everywhere, and so I thought I'd put together a little post with some of my current go-to statement pieces. Statement earrings are also a big love of mine, although I feel like I don't wear them nearly as often as I should. I think statement earrings can look completely amazing with an up-do or a side braid, and I often fantasise about doing my hair in a retro up-do, slapping some bright pink lippy on and a pair of jazzy statement earrings to really complete the look. I find statement earrings, as pretty as they are, can sometimes be hard to get right so I tend to plan my outfit around them to make sure it works. 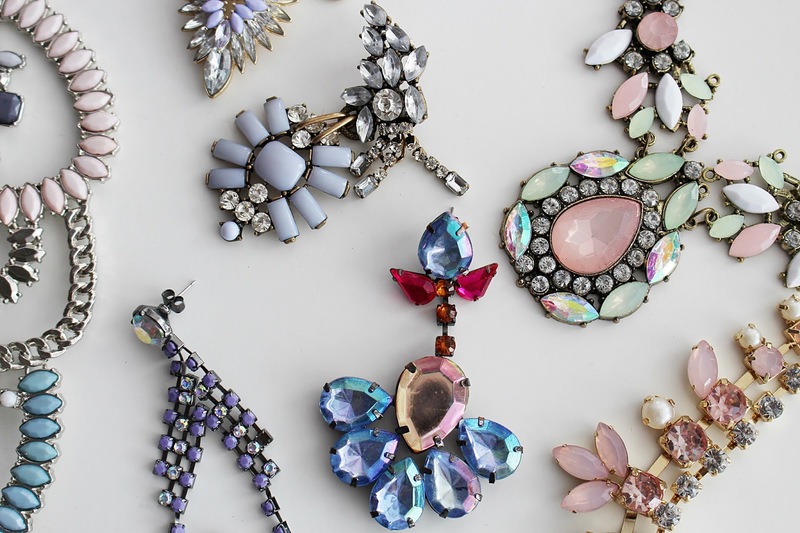 Most of my statement earrings are from H&M, although I also have some from Dottie P's, Vintage Styler and Primark. I'm actually really lacking in the statement bracelet department, but I do like to think I have a few statement watches that keep my wrist game in check. My Michael Kors rose gold watch is by far my favourite and I wear it almost daily with all of my outfits. I'd like to find a watch shop in London the next time I'm down there for events as none of my local stores seem to stock the likes of Michael Kors and I fancy a trying on session! In terms of rings, I have a few cocktail rings that I like wearing on nights out, although I find the really big ones tend to get in the way, despite looking very pretty! What are your favourite statement pieces to wear? Do you have any statement staples that you wear on a regular basis?